One thing I absolutely love to bake all year round but especially in Autumn is Cinnamon Buns. To be honest, my mum usually makes them and this is actually the first time I have baked them. Considering it was the first time, they have turned out pretty great! When I see cinnamon, I think of Autumn and Winter with all of the spices and yummy cakes which shops bring out. Not only do these include a lot of cinnamon and sugar, but they're also made with a brioche bread mix instead of your usual plain bread mix which most people use; the sweeter, the better! These are very popular in my house and you can probably see why. Line a 9x13" tin and a square tin, while also preheating your oven to 190 degrees Celsius. Place the water into a bowl and pour the yeast and 1/2tbsp of sugar on top. Leave to sit for 15-20 minutes or until it's bubbly. Combine the melted butter, sugar and evaporated milk into a large mixing bowl. When your yeast mixture is ready, add this to the large mixing bowl and mix. In a stand mixer, using a bread hook add 3 cups of flour to your mixture and mix. Then add one cup of flour at a time and mix. Once you have added 5 cups in total, add in 1/2 cup afterwards until the dough is no longer sticking to the sides o the bowl, or when your fingers do not stick to the dough. Cover the bowl with cling film and place by the window and allow to rise for 1-1.5 hours. Once it has risen to the top of the bowl, punch it down and pour onto a clean and floured surface. Cut the dough into two pieces and roll one of them out into a rectangular shape. (You can use the other half for a loaf of bread, or rolls, or you can create more cinnamon buns). Spread the melted butter across the dough. Using the cinnamon sugar mixture, sprinkle this over the top of the dough, leaving an inch space around the edge. Push the mixture into the dough. Slowly role the longest side towards you tightly, the way you would a Swiss role. Cut into 2inch slices and place into the prepared tins. Leave on the side to rise for another hour and when it has reached the top of the pan, place in the oven at 190 degrees Celsius and bake for 16 minutes. 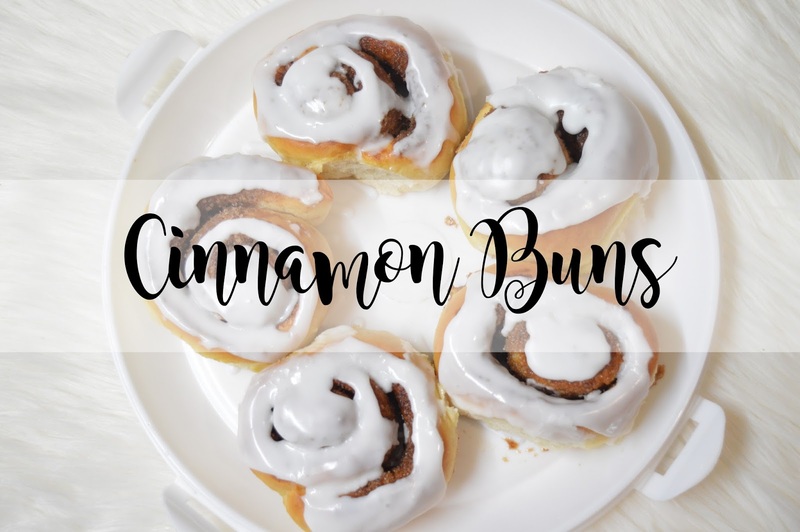 Create a milk and icing sugar mixture, mix together until the desired consistency and decorate the top of the cinnamon buns however you would like to. Leave to set and then enjoy! Have you ever made cinnamon buns?